Pronounced ki - (long i) meera is an african violet that will not produce true from leaf cutting, displays a pinwheel pattern bloom or foliage, and must be propagated by suckers or bloom stalks. 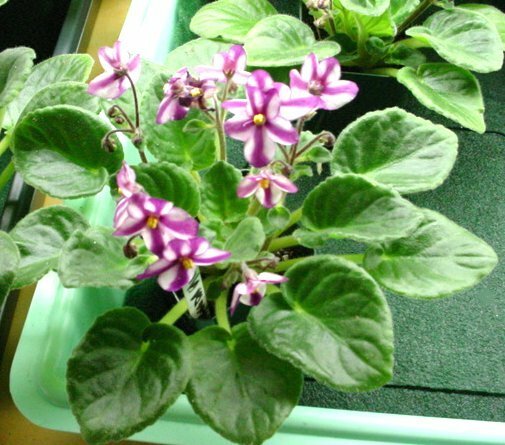 There is a wealth of information about Chimera Violets on the internet and we encourage you to look up Chimera Violets on any search engine to learn more about these spectacular plants. We are located in Lake Tapps, WA which is between Seattle and Tacoma. This website has been active since 2004, and only recently populated the website with a shopping cart (June 2007). We don't advertise and don't intend to do so at this time. Our business is word of mouth only. We are members of the AVSA. My career background is in computers, Information Technology. My growing experience spans my lifetime. I remember my first violet from my grandmother in Endicott New York. I told her how beautiful it was and she asked if I would like a piece. As a youngster, I was perplexed by an idea of a 'piece' of a plant. That turned to astonishment as I watched her go to the sink and cut this plant in half with a carving knife. To my amazement, I watched both of these pieces develop into TWO beautiful plants. We've sold violets on EBay for years with great success. We decided to move away from EBay when it became more expensive to use that venue. We also realized that in order to maintain our reputation, we had to set standards higher than EBay. I made the decision to grow only chimeras as I ran out of space - filling 2 greenhouses. Chimeras have a whole different set of growing challenges. As beautiful as all violets are, everything but chimeras had to go. 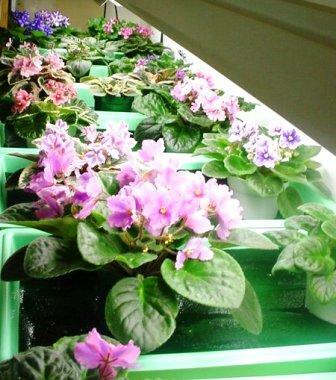 The problem with greenhouses is that there is not enough environmental control for the African violets. We now grow other plants in the greenhouses that are sold locally. Then came a serious change when I started helping a dear friend, Robert Albro. He encouraged me to offer our chimera violets via this forum. In order to feel comfortable doing so, I had to be able to offer the same quality plant that Robert was providing. Our entire operation changed to mimic his setup including a heat pump/air conditioner. Folks in Washington don't use air conditioning - it generally doesn't get that hot here. But on those few hot days when we are in our home praying for some relief, our plants are in a controlled 72 degree room! The growing area is heavily insulation from top to bottom and is sealed at all entry/exit points. How's that for pampered? Robert has since stopped growing violets and moved on to other interests. He has blessed us by sending us the balance of his stock and encouraged us to continue. I will always have Robert to thank for his patience and time mentoring me. When I see these violets, I always think of Robert and the friendship that bloomed through them. Our goal is to maintain the highest standards so that our customers are guaranteed a quality plant - every time. 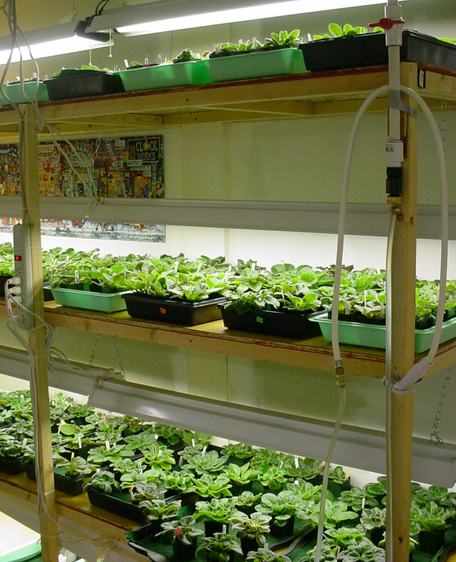 Once the plants are in your care, you are responsible for the care and health of the plant. If you have questions, please feel free to ask. We do not sell any plants that have not bloomed true for us. If we don't like the way a plant is growing, we won't sell it. Period. All of our plants are pest free. All new additions to our inventory are held in separate quarters for approximately 6 months to avoid any contamination issues. 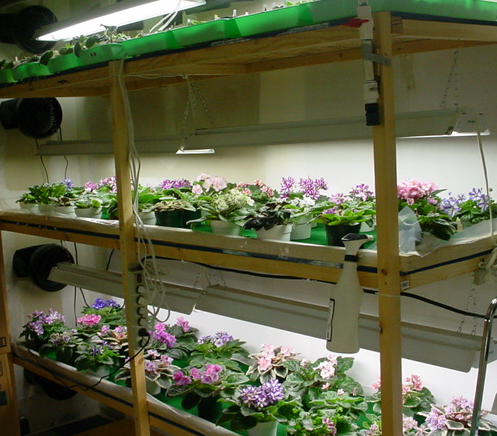 All plants are treated with granular Marathon to avoid potential pest problems. 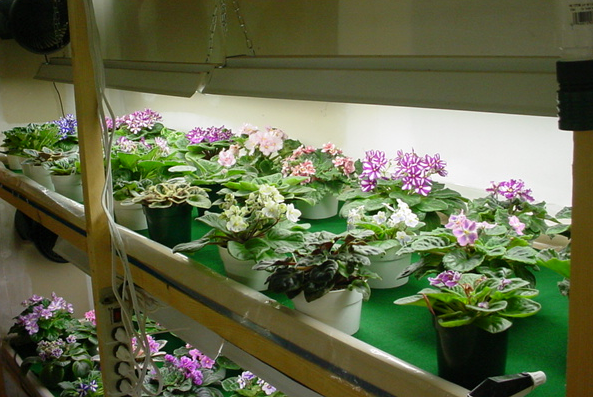 Other chemicals may be used during the growing cycle of the plants to avoid additional pest problems. We do have a FEW violets that are not chimeras. The handful that we continue to grow are Midnight Radiation, Firebird, Canadian Sunset to mention a few. As these become available, we MAY add them to our cart system upon request. Any other species of violet would be posted on Violet Central. For those of you looking for a specific violet, we have a web page just for you! Browse what others are looking for as well as send us your list of 'wanted' varieties and we will list them for you. If we come up with a match, we will connect you to the person and you can arrange a purchase or trade. If you prefer to pay by check, money order or cashier's check, please drop us an email along with the plants you are intending to purchase. We can work out the details from there. All plants are packaged with great care. However, as we can not control the handling by the post office, you may expect some breakage. Although this is rare, it does occur. A few broken leaves is not harmful to the plant, although it can be disappointing. But rest assured, new leaves will grow back! We don't guarantee for leaf breakage but we would like to hear from you if it occurs. In addition, if a plant is damaged beyond survival, you must take a picture immediately upon arrival. No exceptions. If you do not follow this procedure, we will not replace your plant. IF we deem the plant is beyond saving, we will replace with same or equivalent plant. No refunds are offered due to the nature of our business. Give us a try! We think you'll be very pleased that you did!! !